For me, Spring Break signals the coming end of the school year and the transition towards the lazy days of summer, so I like to plan a spring break that balances both relaxation and a chance to learn about the world around us. That doesn’t mean we’ll spend our entire week in museums, though. With a little creativity, your kids can add to their learning wherever you go. I've been invited by Residence Inn to contribute to their Family Travel Talk Forum on Facebook this year. I'm joining several other blogging parents and I'm excited to see it shape up as a lively forum where we can share tips about traveling with kids. This month I am posting about how to balance learning with fun on a family vacation, and I hope you'll join me there! Before you go, look for children’s books set in the destinations you’ll be visiting. Fiction books tend to be the most engaging, but some non-fiction books, like the Horrible Histories series, will capture a leisure reader’s interest too. 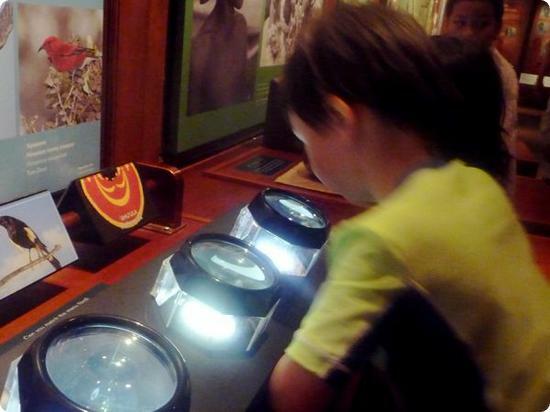 Living history museums and native cultural centers almost always have hands-on activities where kids get so engrossed in what they’re doing that they forget they’re learning! Science and nature are everywhere. A pocket-sized magnifying glass lets your child check out everything from the grains of sand on the beach to the budding flowers in your hotel’s flowerbed. Flying or drive time is a great time to practice school skills, but you’ll only get groans if you break out school-like worksheets. Look for workbooks, toys and stories that are fun enough to hold interest, but provide kids with some practice for new skills. Teacher supply stores can be a great resource, and the iPhone app store is full of educational games. Local camps can provide access to resources or destinations that don't exist in your hometown. Look for nature camps, sailing, robotics or explorer camps and call ahead to find out whether a one-day drop-in is possible. The side benefit is that you might just get a few hours of alone time with your spouse! Sofia Rhodes on April 17, 2014 at 3:51 a.m. This is really what many people are looking for..!! You got a really innovative idea. Atleast, because of your post, many people including me got relief..!! London Escorts on May 8, 2014 at 2:58 a.m. I think it is a better opportunity to learn something new idea in favor of children. Penelope on May 11, 2014 at 11:12 p.m. There some amazing science centers near where I live ... they contain scientific exhibits that not only kids love, but most adults as well! James on May 16, 2014 at 10:48 p.m. This is very useful trip for student. I also seen history museum and science park which is more useful for study purpose. I like this post. San diego hearing centers on May 18, 2014 at 11:37 a.m. This is extremely helpful trek for learner. taxis old ford on August 27, 2014 at 11:57 p.m. Such a very useful article for the students..
Lily Lau on September 12, 2014 at 11:02 a.m.